A month ago I was invited to speak at the naturopathic medical school in Vancouver, BC about my some of my favorite topic, mind-body medicine & the healing power of the breath. As is typical before any travel I take, I jumped online and googled "teahouses in the Vancouver area". 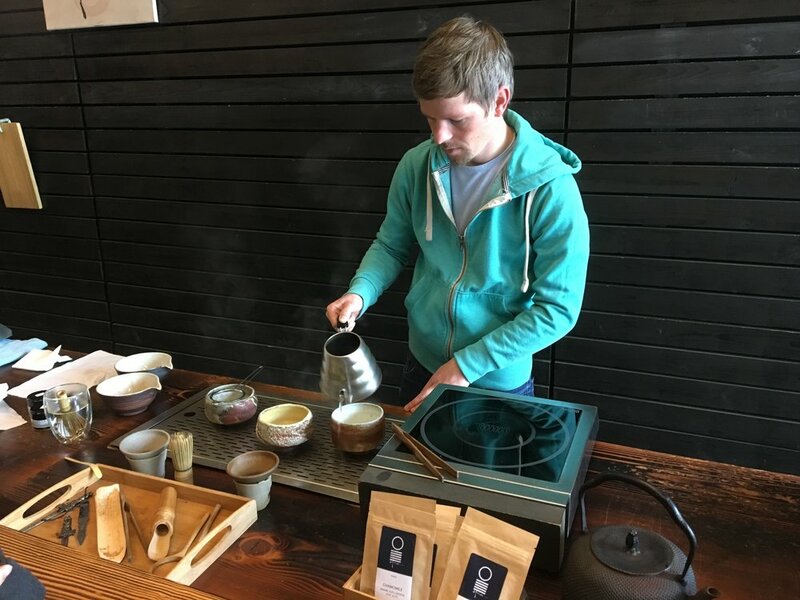 Since neither close to my hotel nor the school, I was resolved to spend my remaining time in Canada drinking in the beauty that O-Five Tea Bar was, before returning to Seattle, and I am oh so glad I did. Being mid-day on a Wednesday, and armed with my gift of parking karma, I found a spot directly in front of the storefront. When I got out of my car, however, I became slightly disoriented when I looked up to see a DavidsTea in front of me. Immediately my heart sank, and I feared that O5Tea had been purchased by the larger company or was put out of business since people might mistaken one tea store for the other. However, looking around I breathed a sigh of relief when I realized that O5Tea was still there. I have nothing against DavidsTea. How could I? A day earlier, I found one of their locations a block from my hotel, and grabbed myself a quick matcha latte before heading to teach. I have visited their establishment on several occasions when traveling, when unable to find a teahouse, or when I am on the go and crave a matcha latte. It is never a replacement for my morning matcha meditation ritual, yet it is still enjoyable. And I can appreciate that DavidsTea and other such chain stores are exposing more and more people to the joy of tea. That said, O5Tea is in another league. First of all, O5Tea is not your typical shop. It is a teahouse which pays attention to every detail. They are Obsessed with the Origin or source of their tea (the O of O5), and they are passionate about and care deeply about the earth from which the tea is grown as well as the people who farm the tea. Believing in harmony and balance, the 5 stands for the elements - Earth, Water, Fire, Wind and the Void. Due to their respect for balance, harmony and the elements, O5Tea encourages the meditative experience of tea. Walking through the door, the calm energy is palpable. The lighting is cool, the colors and materials (wood) are rich and deep. No cold or sterile feeling with bright fluorescent lights at all. This is where you can sit and savor the entire tea experience, and not just grab a paper cup of tea while on the run. As a matcha-holic, I felt as if I entered a matcha nirvana. Not only do they have numerous chawans on display, you are able to select the chawan in which you would like your matcha served, which only enhanced the overall experience. Being able to spend time holding, feeling and examining the bowls that called to me initiated the meditative experience. At first making a selection was daunting since each and every bowl was a stunning work of art. Yet quieting myself, I was drawn to a specific few. Each had its own story and I was please to know others would be standing on this spot, repeating this experience of taking time to be present and examine the vessel in which they will drink their tea. Of course the chawan was not the most important selection in the overall process. I still had to choose my matcha. Fortunately my options were not as numerous. With only four on the menu, I still struggled nonetheless. Thankfully with a recommendation from Jacob who was preparing my matcha, and I settled on two - the organic Kirishima and the Okumidori. Then I sat down at the only table by the window, and patiently waited as my elixirs were prepared. To my table were delivered two intoxicating bowls of thick, rich and vibrant green matcha. Whenever there is organic matcha to be tasted, I must try it, and the Kirishima did not disappoint. It was smooth and creamy with just a slight bitterness, yet it had a lovely sweet vegetal finish which lingered. I loved it. Then I tried the single cultivar Okumidori which whisked into such a rich broth, with a thick creama, and an intense smoothness without any astringency. The finish lasted quite some time and I could feel myself exhaling fully. Of course I couldn't leave Canada without my own supply. I wish I had stayed longer to try the other two matchas on the menu. Were they half as incredible as these... I can't even imagine! You can select the chawan you want to use for your matcha. Each are a work of art. Of course O5Tea serves more than just matcha. They carries a selection of greens, senchas, oolongs, blacks, pu erhs, and even kombucha. And of course, they know the land on which all the teas were grown, and the farms cared for it. Since I fell in love with the Kirishima matcha, I did decide to purchase a few grams of the Kanyamidori sencha from the same farm as well without even tasting it. Once at home, I made a pot and was intoxicated by its subtle aroma and sweet and earthy refined taste. I appreciate all that O5Tea has to offer. If you are a tea drinker of any variety, when in Vancouver, you must visit this place. I promise you won't be disappointed. You can also order online which I plan to do soon as my supply is dwindling. What I love about high quality matcha is not just the unique, incredible, and layered flavor profile, but also the way I feel mentally, emotionally and physically after a few sips. As the Zen monks, samurai and shogun have all recognized, matcha brings clarity to the mind-body. The entire process, from selecting the chawan, to drinking the matcha was an act of mindful attention. The matchas from O5 were incredible, and I with each sip I could feel my entire mind-body respond, as if exhaling completely and fully, releasing any tension and tightness. My mind clears and I am focused. This is not to say such clarity is absent the rest of the day; it is just enhanced. An important point about daily meditation practice, which includes my matcha ritual, is that it trains and re-wires the mind-body to respond in a particular way. If you want to cultivate peace of mind, mindful presence or even compassion, you must practice. As I sit here writing this, all my years of practice enable me to recall that sensation of release, even without tea, allowing me to settle a bit more. One breath practice I often use to further that release of tension is to imagine the breath like a healing wave, traveling throughout my mind-body to the places that require attention. I envision my tension (physical, mental or emotional) as the seashore riddled with footprints, seaweed or small shells. This healing breath washes over those places of tension, wipes them clean, then carries any debris out to the vast eternal ocean and transforms it to peace. Thus with each inhale, I invite in healing and peace, and with each exhale, my mind-body softens and soothes. Walking into O5Tea was like breathing in the healing wave. My mind-body calmed, I settled, and I enjoyed the experience. The next time you sit down with your bowl of matcha or cup of tea, my you find peace and tranquility in the moment.